The warm up is one of the most important parts of your training session. Not only does it get you psychologically prepared for the session ahead but helps reduce the risk of injury. This is the easiest part of the warm up but also one of the most important as it gets the heart rate and breathing rate up, the blood pumping and starts to get you, well, warm! One simple exercise is to get into groups of 4 and simply jog from the try line to the 22m line and back again, using simple hands to pass along the line. When you hit the 22m line turn around and head back to the try line. This helps get you mentally prepared as well by focusing on passing well off your left and right hands. This is the time that the gossiping stops and you hone in on the session ahead. Stretching is a vitally important component of the warm up, it allows ease of movement, increases flexibility and in turn helps to reduce the risk of injury. Stretches should be dynamic and held for 10-20 seconds each. Stretches shouldn’t just focus on the lower body but the upper body and core too. For those who have old injures or specific injury prevention exercise prescribed by an S&C coach or physiotherapist these should be incorporated into this section of the warm up. For ideas for dynamic stretches watch this little video! This is another chance to get you and your team focused on the task in hand. This is an opportunity to get communication levels up and warm up those handling skills too. Rugby Netball is a super simple warm up drill for touch rugby. It focuses on getting players to look for space to run into, offering support to the ball carrier and communication. Divide the players into two teams first of all. 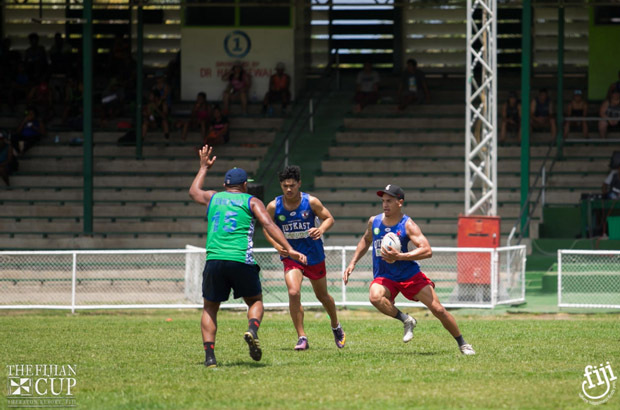 The aim of the game is to score on the opposite team’s try line. This drill can be run on a quarter pitch. The condition of the game is that players can only move if they have NOT got the ball. Once the player catches the ball they have one step to stop moving and look for space. The ball can be placed in any direction and tackling/contact is not permitted. Interceptions can be made and turnover ball is awarded if the ball is dropped, more than one step is taken by the player with the ball or a tackle/contact in made. To make sure everyone gets involved you can bring in the condition that a try cannot be scored until all players on the team have touched the ball. As we said, the warm up is the most important part of a session. Make sure you have your team warm up planned when you come to the Fijian Cup, and remember to bring your own kit. We only provide match balls!